Begin the evening with ground breaking and seminal sound installation and video works -hyper-kinetic imagery and extreme surrealistic visuals abound on the big screen. 3 gallery spaces in which to discover, get here early! 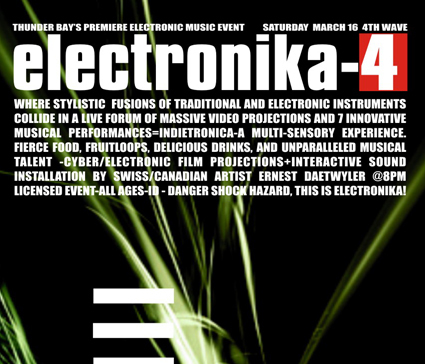 Digital mayhem then begins with the new sounds of Electronika… A MULTI-SENSORY EXPERIENCE. FIERCE FOOD, FRUITLOOPS, DELICIOUS DRINKS, AND UNPARALLELED MUSICAL TALENT AWAIT …Experience electricity in your diet!